While traveling in Asia, Ari Sernik volunteered at a Cambodian orphanage for HIV-positive children. After returning home he devised a way to continue to help: he organized a charity auction of the children’s art work. That experience led him to create Ten-Yad (“Give a Hand” in Hebrew), designed to help children’s charities sell handicrafts. 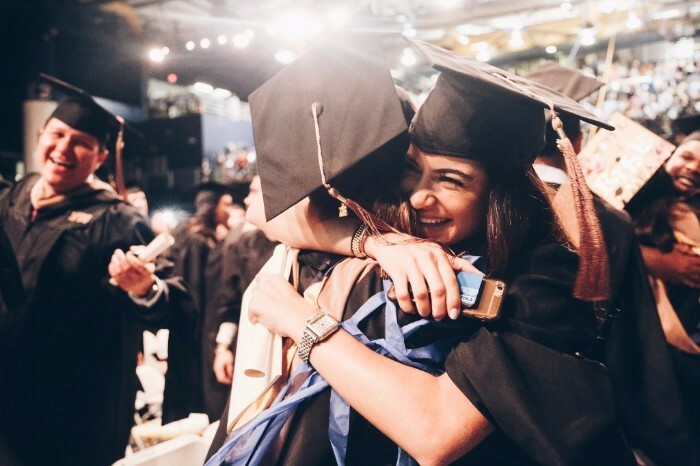 Like Sernik, several members of the FIU graduating class of 2017 did not wait to receive their degrees before they started to make a difference in the world: In 2014 Guy F. Jean Baptiste cofounded the Cercle des Volontaires por Education et le Progres d’Haiti (CVEPH), an organization that provides education and food to children in Haiti. Andrea Saladrigas turned her talent for sales and her entrepreneurial drive into Master Honey, a non-profit that places beehives with low-income women, teaches them business and hive maintenance skills, and buys the honey they produce. Sernik, Baptiste and Saladrigas will be recognized as Worlds Ahead Graduates when they receive their bachelor’s degrees from the FIU College of Business at 2 p.m. on Saturday, April 29, 2017, during the first of 11 graduation ceremonies over five days that will turn 5,099 students into FIU alumni. All ceremonies will take place at the Ocean Bank Convocation Center, 12000 SW 8th Street in West Miami-Dade. Vanessa Morales is a shining example of what is possible with focus and hard work. As the child of a dysfunctional family, she spent years moving around and staying with friends and relatives. One day she started sleeping in her car, which she parked near the recreation center on campus, so she could take a shower in the morning before going to class. A police officer found her and put her in touch with Fostering Panther Pride, a program for former foster children and homeless students. Morales moved into student housing and finished her degree in elementary education in the School of Education and Human Development, part of the College of Arts, Sciences & Education. She will accept one of three job offers but one day she plans to open a learning center for at-risk and foster youth. Morales graduates at 3 p.m. on Monday, May 1. At 20, Michael Perez has been accepted to medical school and plans to become a neurosurgeon involved in clinical research, education and urban health initiatives. While working on his bachelor’s degrees in biological sciences and chemistry in the College of Arts, Sciences & Education at FIU, Perez had a head start on his life goals: He was a leader in his Honors College club’s first medical brigade to the Dominican Republic, where they delivered more than 500 pounds of medical supplies. He taught organic chemistry lab and was a resident assistant in the PantherLIFE program for students with intellectual disabilities. Perez graduates at 10 a.m. on Tuesday, May 2. Albert R. Tano will receive the FIU Medallion – Albert E. Dotson, Sr. Blue & Gold Award at 2 p.m. on Sunday. Arva Moore Parks will receive the FIU Medallion – Cal Kovens Distinguished Community Service Award at 3 p.m. on Monday. Lizabeth Kane-Hanan will receive the FIU Medallion – Outstanding Alumna at 7:30 p.m. on Monday. The late Peter W. Harlem will receive an FIU Honorary Degree at 10 a.m. on Tuesday. Ambassador Steven J. Green will receive the FIU Pillar Award at 3 p.m. on Wednesday. U.S. Rep. Mario Diaz-Balart will be the commencement speaker at the College of Business and the Steven J. Green School of International & Public Affairs ceremony a 6:30 p.m. on Saturday. Miami-Dade County Commissioner Jose “Pepe” Diaz will be the commencement speaker for the College of Communication, Architecture + The Arts at 10 a.m. on Wednesday.